This is truly the longest blog ever. This is not so much to make you laugh at my life like normal. This is just for posterity so that some day when the Little One asks about the day she broke her arm, we can remember. So the last time the school called to say they had a kiddo of mine in the Nurse’s Office, I confessed to being the worst parent ever. My heart dropped and now I teared up but I knew that I couldn’t cry or Sarah would have lost it. So I took a deep breath and made my way back to where she was sitting, surrounded by several school staff members. I could see that her wrist was swollen and bruised. I got the rundown that she was on the monkey bars, her one hand slipped and down she went. When she fell she, of course, put her right arm down to break the fall. She was all alone when it happened. She managed to get herself up and to a teacher who sent her to the nurse’s office. It was very obvious that she was not going to move that arm for anyone. She had it resting across her torso with the left arm on top of it protecting it. I signed the papers to get her out of school and asked if she could walk to the car. She said no. So the principal got a wheelchair, I lifted Sarah into the wheel chair and off we went to my car. I pulled out the car seat, knowing full well that despite my car seat mentality there was no way I was getting this child into her 5-point harness. I lifted her in to the car, buckled the regular seatbelt around her and called The Husband to tell him we were headed to the Emergency Room. He questioned if it was truly necessary and I said yes and away we went. Kaiser is also very close, just one mile down the hill and they have valet parking. We pulled up to valet and I asked the young man for a wheelchair. He got me one and helped me get Sarah out of the car. Then he parked my car for me (What a fabulous service!). By the grace of God, the ED was not that crowded. There was a fabulous triage nurse right there in the waiting room waiting for us it seemed. Frank was very kind and patient. He began taking Sarah’s vitals while I got her checked in. He didn’t touch her arm, just looked her over and mouthed to me, “Pretty sure it’s broken.” I agreed and we were wheeled back to the “fast track” area of the ED. They got Sarah in a bed and offered her some Motrin for pain. They wanted to give the Motrin and few minutes to kick in before we went to X-ray. After about 20 minutes, we were taken to X-ray. Now Sarah has a huge pain tolerance. We often joke that when she falls, she bounces. It takes an awful lot to get this kid down. She can be gushing blood and still wants to keep on playing. So I tried to remain optimistic that X-ray would not be so bad. It was awful. Gut-wrenching, heart-breaking misery. As the poor tech tried to manipulate Sarah’s arm to get pictures, Sarah was literally screaming at the top of her lungs. Huge crocodile tears streamed down her cheeks, snot poured from her poor little nose. It was the worst several minutes ever. She was in excruciating pain and everyone knew it. I tried my best to not look at the shape of Sarah’s arm as it was being manipulated. One time I got a glimpse and it was enough to make me weak in the knees and sweating. It took everything I had to not throw up. The tech was very fast and commented once it was done that Sarah had done much better than she would have done. The tech said she probably would have passed out from the pain. She gave Sarah a wad of stickers and sent us back to the ED. It wasn’t too long before an Ortho PA came and showed us the X-rays. There was no doubt about the pain. The bone had broken and rotated. This was not going to be an easy fix. The official terminology was a right humerus simple supracondylar fracture without intracondylar extension. Basically the big bone in her arm, was broken at the elbow. The PA told us the folks from the cast room would be over shortly to put a soft cast on Sarah to ease some of her pain until surgery could be scheduled. Oy vey! Surgery??? So we were told that they would either do the surgery late that night or send us home and have us come in super early to be the first case of the day on Thursday. While we were waiting for the operating room scheduled to be updated. The cast room folks were very gentle and kind while wrapping Sarah’s arm in a soft cast. This eased her pain tremendously. A bit later the ED doctor came back over to make sure someone from ortho had talked to us. He offered Sarah more pain meds which she took. Then a few minutes later an orthopedic surgeon came to us and talked a little bit more about the elbow surgery required and asked if anyone had told us yet that Sarah’s wrist also appeared broken. Ummm, nope we hadn’t been told that news. Then he went on to tell us we needed to go back to X-ray to get better pictures of the wrist. Let’s just say Sarah was none too happy with this news. We tried to reassure her that now that she had the cast on, it wouldn’t be nearly as bad. And that it was only the wrist, not the elbow they needed pictures of. Off we went back to X-ray. It was fairly painless and again she was given a wad of stickers. Then we went back to the ED to await our fate. By this point it was about 1:30 p.m.. We had been in the ED only 2.5 hours so we were doing well. Sarah was super hungry and thirsty but they wouldn’t let her have anything to eat or drink because they weren’t sure when the surgery would be scheduled. The Ortho PA came back and said they were going to admit Sarah for the night and she would be the first case of the day on Thursday. They wanted to be able to control her pain and get her in first thing. She told us the surgeon would be an orthopedic trauma surgeon named Cameron Sadeghi. We asked more questions about the procedure and who he was. Since it’s her elbow and wrist, we were all very concerned about range of motion and long-term effects. We wanted to know if we would be better served at Rady Children’s Hospital San Diego with a pediatric ortho surgeon. The ortho PA and ED physician reassured us that she would be just fine. 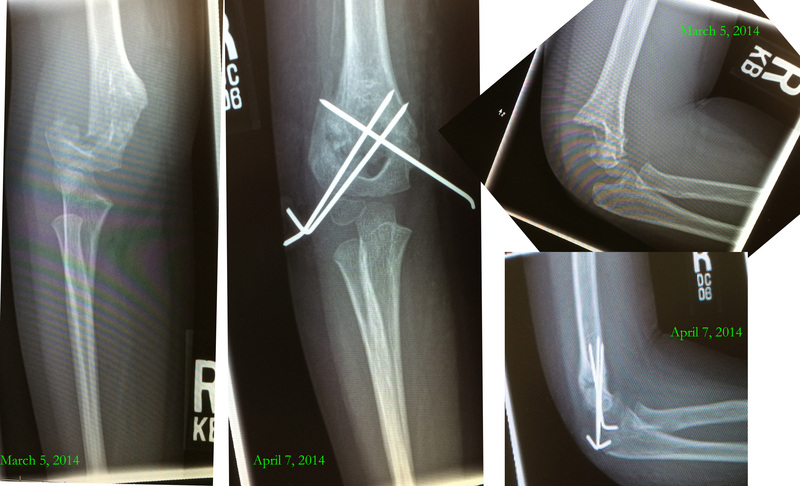 That Dr. Sadeghi was a great trauma surgeon and that he fixes several pediatric arms each week. At this point The Husband and Grandma made it to the ED. The Big One was with a friend and we were coming up with a plan. Since we were just waiting to be admitted, I went home to change clothes, get my phone charger and some home comforts for Sarah (her bear-bear, a blanket and some Doritos!) It was nearing 4 p.m. and we were both super hungry. The cereal we had for breakfast had long worn-off. The kid wanted Doritos and since she was cleared to eat whatever she wanted up until midnight, she got Doritos. While I was gone our friend, Pastor Steve, stopped by the ED to check on things. He had a nice visit and prayed for Sarah with my mom and The Husband. I got what I needed at home and headed back down to the hospital. Finally there was a room available and we were headed upstairs for the night. As they were getting Sarah settled in the room, I noticed it was dinner time and the gentleman delivering meals was the father of a kiddo is Sarah’s class. So he and I chatted for a minute and he gave me a menu for Sarah to choose from. He told her she could have whatever she wanted. Not one to pass on some food, the kid ordered just about one of everything. Her friend’s dad happily obliged and even brought her two brownies. We were in for the night. I’d rather not re-live getting the IV started because that was a nightmare! I think it’s part genetics and part severe dehydration, but it took FIVE nurses FORTY-FIVE minutes and I think it was EIGHT pokes to get the IV started. At one point I felt like I was going to pass out and had to go outside. It was awful. But a testament to Sarah’s toughness, the kid never flinched, never complained, never fussed. God bless Grammy who had arrived just in time to read countless books to Sarah during the entire ordeal. It was a long night of trying to keep her pain under control, while keeping her comfortable and reassuring her that the surgery would be just fine. At the same time I was on my phone putting my mad Internet stalking skills to work to determine that this surgeon was someone really worthy of entrusting my child’s life to. I discovered he is a fairly young surgeon. I think he’s been a Kaiser about three years, was recently married, beautiful wife and wedding and fabulous honeymoon! (Man, the things you can find on the Internet!). He seemed alright so now all we could do was wait until morning. At about 6:30 a.m. they came for us and wheeled Sarah to the OR. The Husband, had tried to sleep at home, but ended up joining us at about 5 a.m. in the room. So now the three of us were just hanging out in Bed 1 of the pre-op area waiting for paperwork and to meet the anesthesiologist and surgeon. Anesthesiologist came first. He seemed like a typical anesthesiologist, a little older, a little crankier, all business. He was ticked because all that work on the IV and it was positional, so Sarah was still really dehydrated. The nurse tried to jerry-rig a board and lots of tape to Sarah’s hand to try and keep the darn IV flowing. It was a challenge. Then we met Dr. Sadeghi. It took all that I had to not ask him old he is. He looks very young. But he seemed nice. He was confident. He was forthcoming with what we should expect. He told us that he fixes these type of fractures all the time. If it’s a simple break it could be re-set in 10 minutes. If it’s a more complicated break it could take up to two hours to re-set. It could require pins. It could require opening up her arm. It could require stitches. He wouldn’t know for sure until he got to work. He did tell us that from looking at the X-rays, the break was pretty bad and would more than likely require at least one pin. Then the time came to say I love You and send her off with these strangers. That part was very difficult. These people were literally going to have my child’s life in their hands. I know it was a broken elbow and wrist, but with anesthesia and the unknown involved it was hard to let her go. We headed to the waiting room, where Aunt Tami had already camped out and saved us some seats. She and I immediately left The Husband with the gear and headed down to the coffee cart. And then we waited. And we waited. And we waited. Now when the surgeon tells you it could take up to two hours, you really don’t want it to. But it did. It was actually two hours and 10 minutes before we saw him emerge. He told us everything went fine. She was in recovery. Her break was one of the worst he had ever had to fix. He ended up putting three pins in her elbow and one in her wrist. We asked about recovery time. We asked about range of motion. We asked about swimming with the dolphins. We asked about water slides. WAIT! Did I forget to mention that we were leaving for a Disney cruise FIVE weeks from the week it happened? Yes for 18 months we had been planning a Disney cruise for my sister’s 25th wedding anniversary. And now we were facing the possibility of a cast on the cruise. Dr. Sadeghi told us to expect the cast to be on for four-to-six weeks. And even if she did get the cast off, there would be no swimming with the dolphins or waterslide. OY! We hung out in the recovery room for about 90 minutes before they moved us back up to Sarah’s room. We didn’t know for sure if we were staying another night or if we’d get to go home. Dr. Sadeghi told u s it depended on Sarah’s pain tolerance. We had a fun day in the hospital. It was Sarah’s roommate’s birthday so we got to have a birthday party complete with Dr. Dog and a magician who performed several magic tricks for the girls. Then at about 4 p.m. Dr. Sadeghi came by, checked Sarah’s arm asked about what meds she had taken and was surprised that she had only asked for one dose, so he said we could go home. We’d follow up with him in a week to get the real cast on. She had to stay home from school for that week. So Papa came to help me load up all the gear we had managed to accumulate over the last 30 hours or so and off we went back home. I can’t believe that any of you would hang on so long to read this! This is the longest blog post in the history of blog posts. I’ll finish the recovery next time!